I’ve been thinking lately about general framework design. Over the next year, we’ll be redesigning the underlying framework of our product for just about every level. Given this undertaking and my strong desire to make sure it’s designed in the most flexible and extensible way, I’m looking for principles that we can apply to our code. 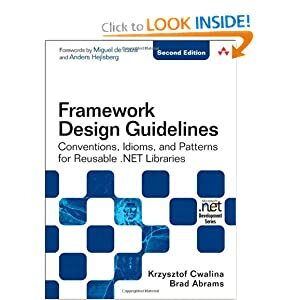 I’m excited by the coverage of new .NET framework features. Hopefully I can glean some good patterns and practices that will help us create a solid and reusable foundation for our product. I plan on requesting the book for our company, so I’ll let you know once I’ve had some hands-on time with it.